Why is this photo so popular? I took this photograph in January 2012 at Glasgow Central train station. It shows two women reading. The older of the two is reading a printed book, the younger is reading from a tablet computer. It struck me that this would make an interesting observation on how technology moves on, but things fundamentally remain the same. A brief observation, nothing special. The photograph has however become my most popular image on photo sharing website Flickr. By some distance too. My photographs usually get about 100 views, sometimes less, and sometimes a few more if it’s a good one. Some of my strangers may achieve three or four hundred views if the rest of the group like them. I’ve taken photographs of professional footballers that may achieve a thousand views, and the few photographs I’ve been lucky enough to have in Flickr’s Explore have reaches two thousand views. 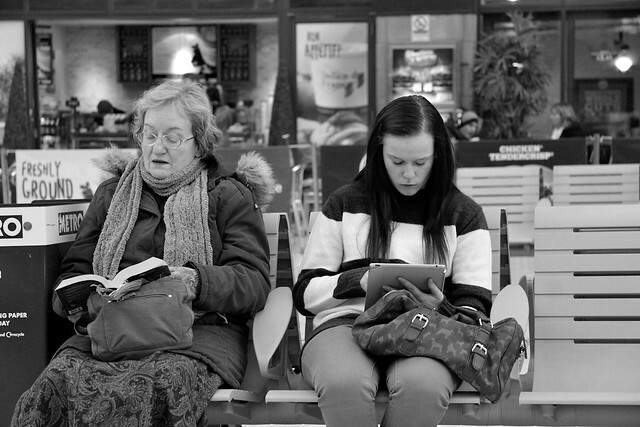 The photography of the two ladies reading has over four thousand views. This I know is not earth shattering, but for me it is unprecedented. It is by far most viewed image but was not explored, is not in a popular group, and doesn’t contain any sports stars.